The conference was a great success, thank you to everyone who came to it (we had 70 delegates) and special thanks to the organizing committee, especially Columba Quigley and Maria Vaccarella, and keynote speakers: Paul Gravett, Brian Fies and Marc Zaffran. Thanks to authors Philippa Perry and Darryl Cunningham, to Giskin Day and Bob Tanner for lending their skills as charimen for the various sessions and to Professors Michael Green and Susan Squier for flying halfway round the world to bring their considerable erudition to the proceedings. We had a truly interdisiplinary cohort of delegates: comics scholars, literary theorists, cultural commentators, healthcare professionals, journalists, bloggers, comics artists and writers, communication of science students and professors of medical humanities. I will write a report in due course, and we are determined to publish the papers and proceedings as a book. 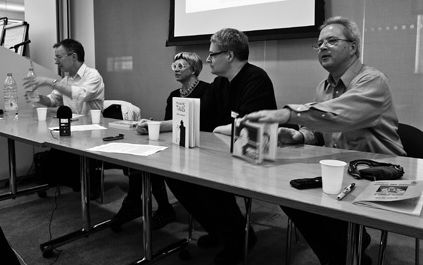 Read what Darryl Cunningham, author of Psychiatric Tales, thought about the conference. is a London-based freelance journalist, curator, lecturer, writer and broadcaster, who has worked in comics publishing and promotion since 1981. He has curated numerous exhibitions of comic art in Britain and in Europe and since 2003 has been the director of Comica, London’s International Comics Festival at the Institute of Contemporary Arts. Paul is the co-author, with Peter Stanbury, of the books Manga: 60 Years Of Japanese Comics (2004), Graphic Novels: Stories To Change Your Life (2005), Great British Comics: Celebrating A Century Of Ripping Yarns & Wizard Wheezes (2006), The Leather Nun & Other Incredibly Strange Comics (2008) and he is the editor of The Mammoth Book Of Best Crime Comics (2008). On television he has been a consultant and interview subject on The South Bank Show’s programme Manga Mania (2006) and BBC4’s documentary series Comics Britannia (2007). Also, he appeared as interview subject in the DVD documentary The Mindscape Of Alan Moore (2007). He continues to write about comics for various periodicals. is a French-born Family Physician and a writer (under the pen name Martin WInckler). He is currently a researcher at the University of Montreal. He has written forty books including novels and essays on patient doctor relationship, the ethics of healthcare and the reprentation of Doctors in mass-media fiction including pulp novels, television drama and comic-books. He is currently studying the works of a French doctor and comic-book artist, Charles Masson. 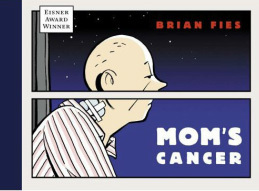 Brian Fies is a graphic novelist from San Francisco who won a prestigious Eisner Award for best digital comic in 2005 after publishing Mom’s Cancer on the internet. The tale of his mothers battle with metastatic lung cancer, the story described how a serious illness affects the patient and family, both practically and emotionally. Many readers wrote to tell Fies how suprised and relieved they were to learn that they were not alone. In early 2006, publisher Harry N Abrams released a hardcover edition of Mom’s Cancer, to widespread critical acclaim. His latest book, Whatever Happened to the World of Tomorrow?, is a unique graphic novel that tells the story of a young boy and his relationship with his father. Interspersed with the comic book adventures of Commander Cap Crater (created by Fies to mirror the styles of the comics and the time periods he is depicting), and mixing art and historical photographs, this groundbreaking graphic novel is a lively trip through a half century of technological evolution. It is also a perceptive look at the changing moods of a nation and the enduring promise of the future.